An ugly contraction in quarterly growth, plus signs companies are slashing spending, raise doubts over Tokyo’s ability to weather a global correction. But the world’s third-largest economy has been underestimated before. If that’s true again, its stock market may be too cheap. 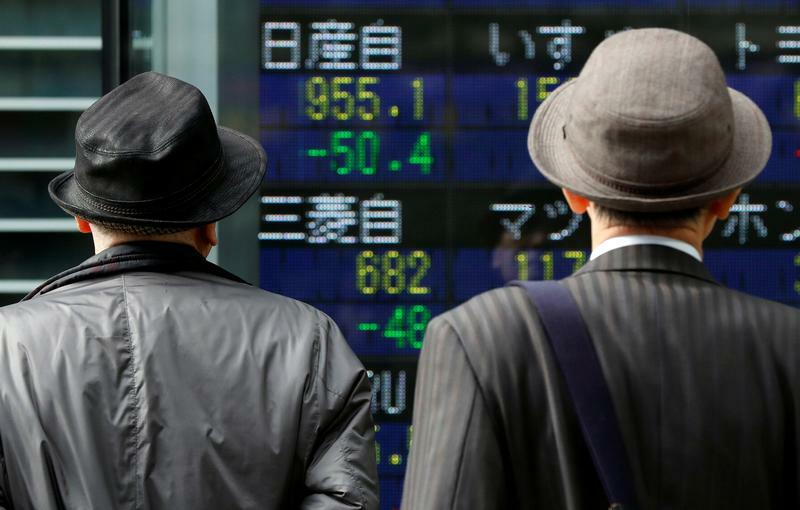 Men look at a stock quotation board showing share prices of Nissan Motor Co (top) and Mitsubishi Motors outside a brokerage in Tokyo, Japan November 20, 2018. Japanese business confidence and capital expenditure plans held steady compared to three months ago, the Bank of Japan’s closely watched “tankan” survey showed on Dec. 14. However, firms expect conditions to worsen in the three months ahead. Japan's economy shrank at an annualized rate of 2.5 percent in the third quarter, the worst downturn since the second quarter of 2014, according to revised data from the Cabinet Office published on Dec. 10. Capital expenditure fell 2.8 percent in the same period, compared to a preliminary reading of a 0.2 percent drop. It was the sharpest decrease since the third quarter of 2009.